Many agencies will tell you that you don’t need to be involved with social media because they can handle everything for you. We think that’s ridiculous. Yes, you can involve a consultant who can create posts on your behalf and connect with other companies and individuals for you. We’ll do that too. But we can’t recommend that you just let us do our thing and report back on some of our activity. You can meet with us regularly to review what we’re doing. You should explore some social relationships on your own because you can develop contacts in ways that match your style, personality and interests. We can guide you as you make your way. As you develop articles, industry guides, resources and other content worth promoting, we’ll be out there as well to promote what you’re offering and championing the value you can bring to new and existing customers. You should stay involved too. Sometimes you’ll tell us about a new civic group you care about. Another day, you’ll take a strong interest in a LinkedIn group. When you’re engaged and support others through your “likes” and comments, they will be more receptive to what you have to say and what you’re pitching when it comes times to announce your latest guide, webinar, seminar, etc. The social media space is huge and we’ll never ask you to get too involved. 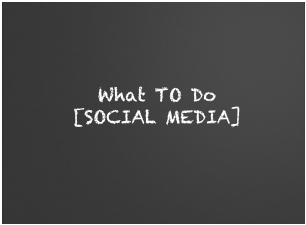 But you should test the waters and heed our advice as you explore what social media offers.